This is the month of an alleged curse that has been plaguing Russia since the early 1990s. August, however, is a great time to travel across the breadth of the country and explore its less visited areas. Summers tend to extend in the easternmost parts of Russia and in many regions, where it can stay warm right until October. Yet, as the days get shorter there is this sad feeling of an inevitable autumn and winter that are lurking the background. One of the main reasons that Russians dream of long vacations in Goa, Thailand or Turkey is that the cold season can seem twice as long as the summer. Late-August is a great time to pick blueberries, gather mushrooms and in the Russian Far East, the waters are warm enough to swim in. The Primorye territory, of which Vladivostok is the capital, receives a flood of swimmers and sun-bathers from places like Yakutia and Magadan, which are among the coldest in the country. In Sakhalin, it’s the Gulf of Aniva that’s a hot spot for divers and swimmers. One August, the waters off the island were so warm that there was actually a sighting of a Great White Shark! Some in Russia consider August to be an unlucky month. Even astrological calculations have been used to explain why so many things go wrong in the country during the month. The 1991 failed Soviet coup d’état (also known as the August Putsch) set off a chain of events that eventually sent the USSR into the annals of history. Whether people view this event positively or negatively, it was a precursor to a very difficult period in Russian history, where people lost their life savings overnight and had to wait in line to buy bread. It’s also in August (2000) that the Kursk submarine tragedy took place and 118 sailors lost their lives. In the same month in 2008, when the world’s attention was on the Beijing Summer Olympics, Mikheil Saakashvili launched a military offensive against South Ossetia, leading to a war with Russia. Many believe that this conflict was a precursor to this year’s Ukraine crisis. There is even a Wikipedia on this August curse and lists every tragedy Russia has faced in the month, right up to last year’s floods in the Khabarovsk and Amur regions. One can only hope that tempers cool in Ukraine and that this crisis doesn’t turn into a full blown war. Some irresponsible reporting by western journalists near the Russia-Ukraine border is leading to even more tensions in this stand-off. The curse of August has a way of affecting the most unusual suspects. I remember an executive with Shell smirking about stupid superstitions and mocking a Russian colleague who said the month carried curses. This was the summer of 2006 and a time when intense pressure was applied by Moscow to force the Anglo-Dutch company to let Gazprom take control of the Sakhalin-2 project. By the end of August, the writing was on the wall and Shell, which couldn’t stand a media onslaught from the Kremlin and its environmental authorities caved in. The Dutch executive lost his job to a Russian specialist. In many parts of the Russian Far East, the hottest days of the year are usually around the middle of August. Some believe that the weather leads to heated tempers and break-ups. I’d seen my fair share of break-ups in the month, including an 8-year long friendship going sour since two people kept getting irritated on board poorly ventilated Trans-Siberian trains. Personally, I’ve been spared from this mysterious August curse. The latter part of this month is a very good month to travel in Russia. It’s still warm enough to camp outdoors and since there isn’t as large a difference between the temperature of the air and that of the water, the skies are clear and perfect for star gazers. 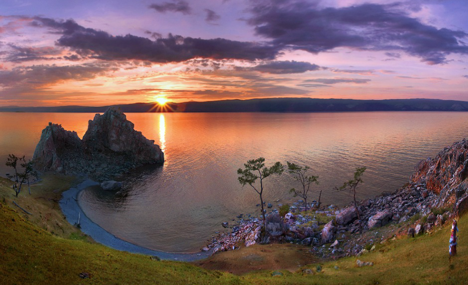 The best place to spend the last couple of weeks of August is around Lake Baikal. The Great Baikal Trail, an Irkutsk-based NGO has done a great job of building hiking trails around the world’s deepest lake. This is an ideal place to go to get away from city life and be one with nature in the great outdoors. This year, the Hindu festival of Ganesh Chaturthi falls in the month of August. As a popular story goes, Ganesha, our beloved elephant-god, was hungry one night and saw what he thought was a coconut. The coconut was the reflection of the moon in the water and when Ganesha couldn't pick up the ‘coconut,’ the moon laughed at him. Ganesha cursed the moon and so, if someone looks at the moon on Ganesha's birthday, that is Ganesh Chaturthi, he or she will be falsely accused of wrong doing. According to legends, even Krishna wasn't immune and was falsely accused of stealing a gem, after he saw the moon on Ganesh Chathurthi. There is a rider to that story that you can look at the moon, once a lamp has been lit at home. I explained this story to a Russian friend who claimed to be a very rational thinker. He laughed it off and went outside to get glimpse of the moon. Two days later, he narrated how he was accused of doing something that he would never do in his wildest dreams. This incident happened in another year when Ganesha’s birthday was in August. Did my friend have the effect of two curses in one?